Modern & sleek, a stunning bangle that is a very popular item in our range of quality jewellery. 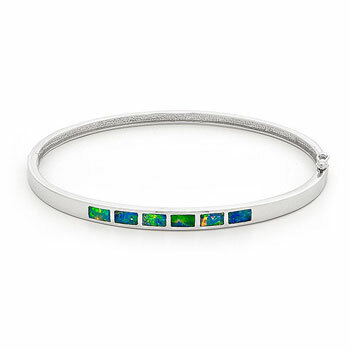 To create this piece, genuine Australian light crystal opals are sourced from fine opal mines in Coober Pedy South Australia, which are then carefully colour matched before being cut, bonded and polished into the precious 14K White Gold setting. A very stylish piece of modern jewellery that is fantastic as a daily wear.